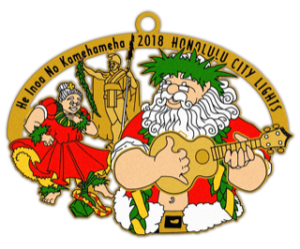 On Oahu, the annual Honolulu City Lights is a month long Christmas lights and decorations display at Honolulu Hale that includes a 50-foot Norfolk pine decorated Christmas tree, Shaka Santa and Mrs. Claus, the indoor tree display and corridor of wreaths. I have enjoyed driving around the area with my family to see the lights while many people enjoy walking the grounds around Honolulu Hale. The first recorded Christmas in Hawai’i was in 1786, when Captain George Dixon of the merchant ship Queen Charlotte docked the ship on the Hawaiian Island of Kauai. Dixon and his crew celebrated a large Christmas dinner that included a whole roast pig. The ancient Hawaiians did not celebrate Christmas until after the arrival of the missionaries in 1820. Christmas occurred during the Makahiki, the four month period of resting and feasting when ancient Hawaiians honored the earth for giving them plenty to eat. No conflicts or wars were allowed during this time. After the Hawaiian embraced Christianity, it was only natural that they adapted some of the traditions of Makahiki to the celebration of Christmas. King Kamehameha IV and Queen Emma of Hawai’i officially celebrated Christmas in 1856 as a day of Thanksgiving. On Christmas Eve of 1858 Mary Dominis threw a party at Washington Place featuring the first instance of a Christmas tree and Santa Claus in Hawaii. King Kamehameha IV declared it an official holiday in 1862. Today, the traditions on Christmas day are similar to other places; families gather for a large meal and then perhaps go surfing or swimming in the ocean and play ukuleles and dance hula late into the night. The different cultures and ethnic groups that have settled in the islands celebrate the Christmas traditions in their own unique ways. Santa Claus (Hawaiian: Kanakaloka) is not wearing his corporate red and white suit, but has swapped it for aloha shirt and short and slippers. Santa hats are worn and the traditional Santa’s sleigh and reindeer are replaced by an outrigger canoe pulled by dolphins. The greeting Merry Christmas was difficult for the Hawaiians to pronounce because English language sounds like “R” in the word merry did not exist in the Hawaiian language. Thus, Mele Kalikimaka is not a literal translation but simply how we say Merry Christmas in Hawai’i. In 1949, R. Alex Anderson wrote Hawaii’s popular Christmas song “Mele Kalikimaka.” He was born in Honolulu in 1884 composed nearly 200 songs before his death in 1995. As the story goes, in 1949 Anderson was in his office in Honolulu when his secretary, a woman from the mainland, mentioned that she had never heard a Hawaiian Christmas song. Thus, he composed Mele Kalikimaka and it became an enduring classic. Bing Crosby and The Andrew Sisters made one of the earliest recordings in 1950 on 78 rpm and 45 rpm phonograph records. ‘Ukulele players can learn to play my arrangement of Mele Kalikimaka for free! Learn Mele Kalikimaka in the sample format of Monthly Online Lessons. Learn Mele Kalikimaka in the sample downloadable files of Single Song Purchases. Mele Fong presented Legacies of Hawaiian Leaders on August 29 on Maui. Five Hawaiian royalty and their legacies for health, education, and welfare were presented plus 5 related songs. “My friend really wanted to come to your program, but couldn’t get in,” commented one student. “I was on the waiting list and lucky to get in,” said another student. When I asked for feedback after the program, there was an enthusiastic response that I should continue the series next year. “Where else will be learn our Hawaiian history?” asked a student. 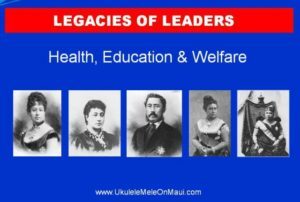 Fifteen people signed up for Legacies of Hawaiian Leaders, the third program in my new Hawaiian History and Song Series for 2018 on Wednesday, August 29 from 10 a.m. to 12 p.m. at Kaunoa Senior Center for adults 55 and better. The program was two-fold: part lecture and part sing-along. In Part One we learned about 5 Hawaiian ali’i (royalty): (Queen Emma, Bernice Pauahi Bishop, King William Lunalilo, Queen Kapiolani, and Queen Lili’uokalani) and what they left behind that we benefit from today. In Part Two we sang 5 Hawaiian songs composed by or appropriate to remember the ali’i. Aloha ‘Oe – Morse Code Strum. Hawaiian Lullaby – Pick in 4 / Latin Strums. King Kamehameha the Conqueror of the Islands – I Wanna Rest / 4And Strums. Wahine Holo Lio – Pick in 4 / I Wanna Rest Strums. DOWNLOAD A SINGLE SONG PURCHASE to your digital device. Get the song sheets, video lesson, audio recording, and video story behind the song bundled for one low price. PURCHASE A PACKAGED SONG SET OF BOOK/DVD/CD. Get the song sheets, video lesson, and audio recording for 6 songs with 8 unique strumming styles to learn off-line. Nostalgic Hawaiian Songs, Vol. 1 – Aloha ‘Oe plus 5 other songs for intermediate ‘ukulele players. Nostalgic Hawaiian Songs, Vol. 2 – Hawaii Aloha, plus 5 other songs for intermediate ‘ukulele players. From the Hapa Haole Songs Category – Hawaiian Lullaby and King Kamehameha. From the Hawaiian Songs Category – Wahine Holo Lio. The Hawaiian History and Song series continues on the 5th Wednesdays of the month. The next program is October 31 and is titled The Merrie Monarch. Visit my webpage about oral history, classes at Kaunoa and see photos from past Hawaiian history programs for more information. Mele Fong presents Legacies of Hawaiian Leaders on August 29 on Maui. Five Hawaiian royalty and their legacies for health, education, and welfare will be presented. Legacies of Hawaiian Leaders is the title of my program on Wednesday, August 29 from 10 a.m. – 12 noon at Kaunoa Senior Center for adults 55 and better on Maui. We will learn about Hawai’i’s royalty whose legacy included Queen’s Hospital, Kamehameha Schools, Lunalilo Home, Kapi’olani Children’s Hospital, and Lili’uokalani Trust. Plus we will sing some songs related to the time period and learn the stories behind the songs in keeping with Hawaiian oral history traditions. Participants can follow the song’s lyrics and ‘ukulele chords projected onto the large screen at the front of the room (similar to Sing-Along with Mitch Miller). All ‘ukulele players are invited to bring instruments to play along as I lead everyone by singing and playing my ‘ukulele while my husband accompanies us on ‘ukulele-bass. Similar to the new additions in my Sing-Along with Mele Fong series, there is a slide before each song that shows the unique strum graphic (how we play the rhythm) and the chord shapes with corresponding finger numbers for playing the ukulele. Don’t worry if you don’t know the ‘ukulele chords or the unique strumming pattern for the songs. The focus is on learning Hawaiian history, singing the songs, finding out the stories behind them, and enjoying the group experience. Lunch is optional and a good time to sit around and talk story with like minded people who enjoy Hawaiian history, singing, and playing the ukulele. This program is the third of the new Hawaiian History and Song series for 2018 on the 5th Wednesdays of the month. The next program is titled The Merrie Monarch scheduled for October 31. KEEP HAWAIIAN MUSIC ALIVE from wherever you live! Click here. On Friday, August 21, 1959, Hawai’i became the 50th state of the union. Photo by Star Bulletin photographer Albert Yamauchi of news carrier Chester Kahapea. On August 21, 1959, President Dwight D. Eisenhower signed a proclamation welcoming Hawai‘i as the 50th state of the union and ordered a new American flag to feature 50 stars. The new design became the official American flag the following year on July 4, 1960. The effort for statehood had started in 1919 by Prince Kuhio as Hawai‘i’s non-voting delegate to the U.S. Congress, and took 40 years and five failed attempts before the Hawai‘i Admission Act was approved. 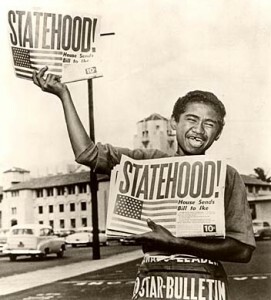 On June 27, 1959, Hawai‘i residents voted 94% in support of statehood. Since 1969, Hawai‘i has commemorated this anniversary with a state holiday on the third Friday in August. The holiday was originally called “Admissions Day,” but since 2001 it has been called “Statehood Day.” I find it interesting to note that out of all 50 states, only five have official statehood holidays (Kentucky, Tennessee, Nevada, West Virginia, and Hawai‘i). Read more about Hawai’i Admissions Day in my previous blog post. We will commemorate the occasion by playing “Island Songs” at my monthly Sing-Along with Mele Fong series on Thursday, August 16 from 10 a.m. – noon at Kaunoa Senior Center for adults 55 and better. ‘Ukulele players are invited to play-along as everyone sings-along to ten popular songs of the Hawaiian Islands. ‘Ukulele players living away from Maui can also learn to play Hawaiian songs and understand the stories behind them from wherever you live through my website. KEEP HAWAIIAN MUSIC ALIVE! 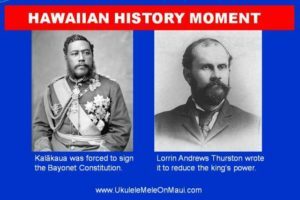 – VISIT https://ukulelemeleonmaui.com/learnwithmele/learn-online/hawaiianhistory. Visit my Products and Services webpage for all the ways you can learn to play the Ukulele Mele Way. You can have fun learning my unique method for forming ‘ukulele chord shapes with minimal muscle strain and strumming patterns for fun, sing-along songs. Are UKE having fun yet? On July 6, 1887, King David Kalakaua was forced by gunpoint to sign a new constitution that reduced his power and gave most of it to his cabinet of businessmen. Lorrin Andrews Thurston wrote the constitution known as the Bayonet Constitution, and later led the overthrow of the monarchy. All was not merry during Hawaii’s King David Kalākaua’s reign. While sugar profits grew and Hawaii’s economy flourished, business deals and corruption seeped into government. On July 6, 1887, Kalākaua signed a new constitution known as the Bayonet Constitution because he was forced to sign by gunpoint. The armed militia of the business community comprised of mostly non-Hawaiians made the king an offer he could not refuse. Lorrin Andrews Thurston wrote the new constitution and admitted that the document was signed under shady circumstances. Later in 1893, Thurston led the overthrow of the monarchy. Keep Hawaiian songs and stories alive by clicking here. The Hawaiian Serenaders, comprised of the husband-wife duo of Rich Tom and Mele Fong, present Story of the Ukulele and Concert on Saturday, June 9 at 11 a.m. at Lahaina Public Library on Maui. The program includes the history of the instrument, display of different sizes of ukulele, and a variety of songs to demonstrate the instrument’s versatility. 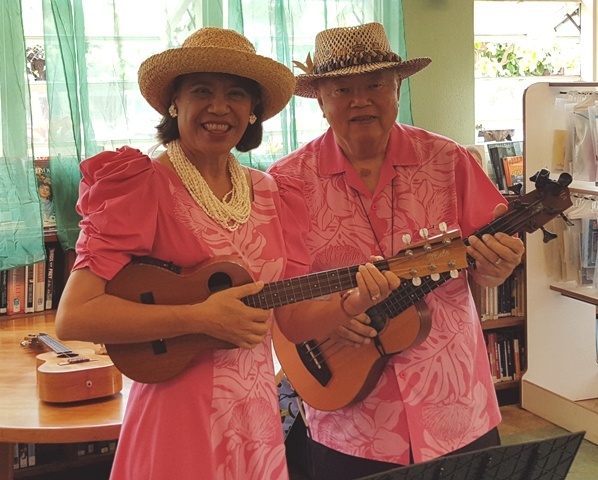 The Hawaiian Serenaders, comprised of the husband-wife duo of Rich Tom and Mele Fong, present Story of the Ukulele and Concert on Saturday, July 9 at 11 a.m. at Lahaina Public Library on Maui. The program includes the history of the instrument, display of different sizes of ukulele, and a variety of songs to demonstrate the instrument’s versatility. We are honored to be sponsored by the University of Hawaii Statewide Cultural Extension Program to be able to present our educational program to the public. Our appreciation goes to the head librarian who asked us to return after performing at Lahaina Public Library twice last year. Read about the program we did for 50-5th graders on Wednesday, April 26, 2017 by clicking here. Read about the program we did for the general public on Saturday, July 1, 2017 by clicking here. For more information about the entertainment services of our duo, The Hawaiian Serenaders, click here. State Holidays was the title of the program on Wednesday, May 30 at Kaunoa Senior Center on Maui. This was the second in the new Hawaiian History and Song Series for 2018. 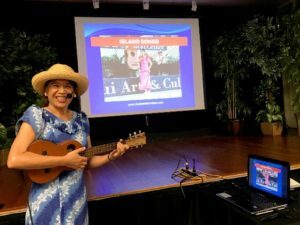 Seventeen people signed up for State Holidays, the second program in my new Hawaiian History and Song Series for 2018 on Wednesday, May 30 from 10 a.m. to 12 p.m. at Kaunoa Senior Center for adults 55 and better. The focus was on learning the history behind Kuhio Day and Kamehameha Day, Hawaii’s two state holidays honoring past royalty, and singing related songs. Part one lecture took about 60-minutes, followed by Part two taking 25-minutes to get through five songs. The first two songs honored Kamehameha and the second two songs honored Prince Kuhio by taking place in Waikiki where he lived with his wife. Afterwards, one new attendee came up to ask when the next program would be (just when I’m wondering whether to continue the history series next year). It was rewarding to see many returning people who expressed their enjoyment of the program, too. Hawaii Ponoi – Waltz Variation Strum. King Kamehameha the Conqueror of the Islands – I Wanna Rest/4And Strums. Kaimana Hila – ‘Ōlapa Strum. Nostalgic Hawaiian Songs, Vol. 1 – On The Beach At Waikiki plus 5 other songs for intermediate ‘ukulele players. Nostalgic Hawaiian Songs, Vol. 2 – Kaimana Hila, Hawaii Aloha, plus 4 other songs for intermediate ‘ukulele players. SCHEDULE PRIVATE WEBCAM LESSONS. Listen to the audio recording of King Kamehameha on my website Fan Club, and then get the song sheet with your private webcam lesson on how to play it. The Hawaiian History and Song series continues on the 5th Wednesdays of the month. The next program is August 29 and is titled Legacies of Hawaiian Leaders (Queen Emma, Bernice Pauahi Bishop, King William Lunalilo, Queen Kapiolani, and Queen Lili’uokalani. Visit my webpage about oral history, classes at Kaunoa and see photos from past classes for more information. State Holidays and Song is the title of the program on Wednesday, May 30 at Kaunoa Senior Center on Maui. State Holidays and Song is the title of my program on Wednesday, May 30 from 10 a.m. – 12 noon at Kaunoa Senior Center for adults 55 and better on Maui. 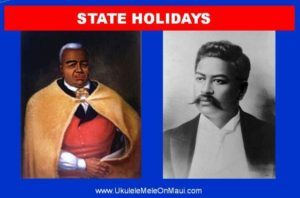 We will learn about Kamehameha Day and Kuhio Day and the significance behind these two state holidays honoring Hawai’i’s royalty. Plus we will sing some songs related to the time period and learn the stories behind the songs in keeping with Hawaiian oral history traditions. Similar to the new additions in my Sing-Along with Mele Fong series, there is a slide before each song that shows the unique strum graphic (how we play the rhythm) and the chord shapes with corresponding finger numbers for playing the ‘ukulele. Don’t worry if you don’t know the ‘ukulele chords or the unique strumming pattern for the songs. The focus is on learning Hawaiian history, singing the songs, finding out the stories behind them, and enjoying the group experience. Lunch is optional and a good time to sit around and talk story with like minded people who enjoy Hawaiian history, singing, and playing the ‘ukulele. This program is the second of the new Hawaiian History and Song series for 2018 on the 5th Wednesdays of the month. The next program is titled Legacies of Hawaiian Leaders scheduled for August 29.